On average how much do makeup artists charge? I havent contacted any hair or make up artists yet..just wondered on average what i can expect to pay? I want my long hair down in curls and i havea tiara to wear but i want to put that on myself as i know how i like it. Bridesmaids i want simple up do. I do my own tan and nails always. Oh, I'm in the South West. I've been looking for a make up artist myself over the last week. I have gone with a girl who charges £60 total for the wedding day make up AND trial. There are charges should mother of the bride and bridesmaids want theirs doing too though. But I thought £60 total seemed reasonable. It's about average for the others I considered too. mine is 95 for hair and 95 for make up! does it at venue so pushes price up. Mine is £220 for hair and makeup including some falsh individual lashes. She is charging BMs £70 each. She is coming to our hotel on the morning of the wedding though as me and BMs are sleeping over night before. Trials £35. Not a bad wage for a day's work though! 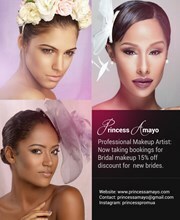 My make-up is £190 for trial and on the day for myself, 2 adult bridesmaids, 2 junior bridesmaids and MOB. She has fantastic reviews and is considerably cheaper than many people I have found in my area. Haven't got a price for my hair yet but am having that done at my regular salon. im a hair and makeup artist . i charge £60 for hair and makeup bridal trial and £150 for the day for hair and makeup for bride. i can do group packages and discounts . 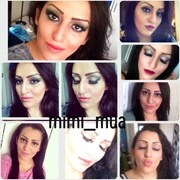 you can contact me by email : [email protected] or by facebook searching mimi_mua . Im trained by the one and only Samer Khouzami lebanese top celebrity makeup artist. I charge £65 bridal hair and make up trial then £120 on the wedding day. I have 20 years experience so brides are paying for that plus expensive products used. I am in the north east of England. Hi I'm a make up artist in South Wales area ... I charge £50 bridal make up on the day and same price for a trial so £50 this includes false lashes ... For bridesmaids and mums etc it is £40 per person again with false lashes. The only additional charge is a 40p per mile travel charge after 10miles traveled from my base location. Hope this helps. I am a professional Makeup Artist based in London. I am a training mua and hair dresser and would love for models to come in. I am new to the industry therefore i do my prices really cheap if anyone is interested. The trail will be £20 and £35 on the day. Some if what i have done is on my makeup instagram profile ; char_makeupxo which will show you how far i have come. I would also love to try and test things on models so i can experiment on different face shapes, eye shapes and skin types. Thank you, Charlotte!! would love to hear from you.